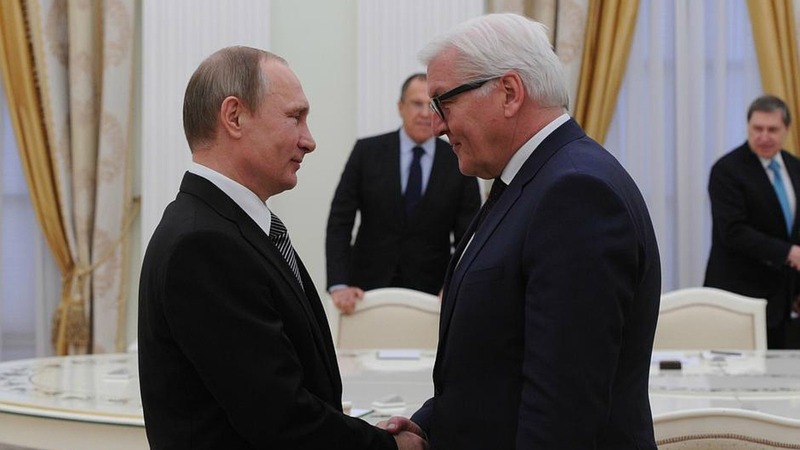 German Foreign Minister Frank-Walter Steinmeier said on 31 May that Germany would consider easing sanctions on Russia gradually if there is “substantial” progress on the issue of Ukraine. A day earlier, German weekly Der Spiegel published a story indicating that German Chancellor Angela Merkel’s government is considering lifting some initial sanctions, such as travel restrictions, in return for Moscow’s cooperation on local elections in eastern Ukraine. The article made it clear that senior officials want to become more proactive in finding a way out of the stalemate. Russia has clearly demonstrated that it will not change its policy toward Ukraine because of the sanctions, and Ukraine has become something of a frozen conflict. Kyiv cannot regain control of the parts of Ukraine under the control of pro-Russian elements, nor can it change the status of Crimea. At the same time, Russia cannot prevent Kyiv from forming close ties with Europe and the United States, nor can it trigger an uprising in eastern Ukraine. Short of direct intervention in Ukraine, Russia has been blocked. And a direct intervention would not be easy or without risk for the operation itself, or Russian interests elsewhere. Therefore, it would be surprising if the Germans didn’t search for a way to lift sanctions, in order to normalize bilateral relations with Russia. From Germany’s point of view, the worst case scenario would be a Cold War to its east. The European Union is sufficiently fragile to frighten Germany. A confrontation between Europe and Russia would likely shatter the EU. NATO is the European defence system, but it has responded minimally to this point. Should the confrontation endure and escalate, the United States would use NATO as a vehicle to conduct a containment strategy against Russia. Germany needs to hold the EU together because about a quarter of its GDP is derived from exports to Europe. The expectation of countries like Poland, Romania and the Baltics is that Germany would participate fully in containing Russia. Other parts of Europe that have no interest in such a confrontation would pressure Germany to block the American strategy. Germany is forced to infuriate some part of Europe in this situation. Given the fragility of the EU, the pressure of a Cold War could be the final blow to European unity. Since the Russians have not capitulated to sanctions to this point, it is unlikely that they will. Therefore, it is in Germany’s interest to defuse the confrontation with Russia, and to do that, they must at least loosen the sanctions, or ultimately eliminate them. There is a basis for a compromise in Ukraine. The Russians want a neutral Ukraine. Kyiv may maintain whatever economic and political relations it wishes, but it must not become part of the Western defence system. What Russia cannot tolerate is Western forces on the Ukrainian-Russian border. That would represent an existential threat to Russia. While such a presence is a bare possibility far down the road, Russia has learned in its history that bare possibilities can rapidly turn into realities. Therefore, neutralization of Ukraine in terms of defence relations is the foundation of any settlement for the Russians. Other issues such as some degree of autonomy for eastern Ukraine are manageable if Russia gets neutralization. Of course, on the list of other things – far more important than eastern Ukrainian autonomy – that Russia would want to revise is the growing US presence in the Baltics, Poland and Romania. I’ve written extensively about the century-long commitment of the United States to prevent a hegemon from consolidating the resources of the European Peninsula and Russia. The United States resisted potential hegemons in the two world wars and the Cold War. This is the fundamental geopolitical interest of the United States, towering over its interest in who owns what island in the South China Sea. Russia, having sensed a Western push eastward, responded as it normally does by pursuing a blocking position. The Russians would certainly ask for a removal of forces based on NATO’s eastern front. And now we come to the heart of any settlement over Ukraine. The Russians, having seen a force of any significant size to their west, will not trust the West’s commitment to neutralization. The Americans will not trust the Russians to respect Ukrainian neutrality without a US-led force providing a deterrent in the region. The Russians will not believe that force will respect Ukrainian neutrality. And this is the dilemma the Germans face. The Ukrainian crisis has drawn the US military into their neighborhood. The Germans, along with other European countries, want to end sanctions. The US deployment of troops in the region has made getting rid of sanctions far more difficult and has turned the sanctions into a side issue. The Russians have a bigger worry: American intentions. Therefore, this probe by the Germans on lifting sanctions faces a far more difficult hurdle. Eliminating sanctions will not assuage Russian concerns and would undermine the American deployment, which is taking place in the context of NATO. The region is in a different place than it was when sanctions were imposed. Germany is, as we have argued, facing serious economic problems. The European Union and NATO – both pillars of German national strategy – are experiencing friction, within and between them. And the Americans, pursuing their own interests, are posing a challenge on the eastern edge of the EU, as is Britain in the west, and Mediterranean Europe in the south. The normal strategy for Germany is to do nothing. But doing nothing, in this case, means allowing a set of destabilizing forces to undermine core German interests. While the Americans and Russians pursue their interests in Europe, Germany cannot yet act on its century-long strategy of building its military power to protect its interests. Taking that as a given for now, the only other option for Germany is to find another means to balance the Russians and Americans. The Americans are the stronger power, but far away and not yet committed to a full-scale deployment equal to the Cold War. The Russians are far weaker, but much closer. That equalizes the two. At the moment, the Germans worry about the Americans more than they worry about the Russians. The Russians are pursuing their buffers. The Americans, in resisting that, may do what they did during the 20th century – swamp Europe with its power. Given German economic vulnerability at the moment, the Americans can destabilize the foundations of Germany. Therefore, it makes sense for Germany, playing the balance of power in Europe as Britain did in the 19th century, to reach out to Russia. Russia can counterbalance the Americans and would welcome German economic activity in the country, given its weakened economy. But eliminating sanctions doesn’t fully solve Germany’s problems. The core problem, a Cold War emerging to its east, is the real issue. Of course, if Germany pursues this strategy, NATO and the EU are likely to fragment as well. But Germany may have reached the conclusion that these institutions, even if they survive, will not function as they used to and are worth the price if a balance of power that contains the Americans can be created. What George Friedman gets wrong (and all world’s politicos) is the mood of the American people. Why else is the world watching the circus that has become the next presidential election where the two leading candidates are intensely disliked and the least trusted? NATO is at it’s weakest point now than at any time in it’s long history. At the last NATO summit two years ago in Wales, member states pledged they would invest at least 2 percent of gross domestic product in defense and 20 percent of that sum in equipment. Not a single country has fulfilled the criteria, not even the United States. If anyone believes that Americans will die for Ukraine they must have fallen through the rabbit hole with Alice. Putin chose to seize the opportunity in Ukraine because he perceived zero threat from NATO not because he feared the possible presence of NATO in Ukraine. There was no perception of an existential threat to Russia as Friedman asserts. Putin assumed the West would do little more than complain as Russia seized the opportunity to expand its sphere of influence. Lavrov in early 2014 predicted that Russia would be back in the G8 within a year and half. Putin also assumed the Ukrainian military would be totally ineffective. The Russian troops massed on Ukraine’s border in early 2014 were ready to move. Putin Russia had a real opportunity to seize control in Kiev, if the capital descended into chaos as Yanukovych fled the country. The West’s perception of Ukraine’s economy as a basket case would evoke little sympathy from Germany, France and other EU publics to Russian action in Ukraine, if the chaos of a civil war began. Quick restoration of order may have even been welcome by many in the EU. But, chaos did not emerge. In the words of Igor Girkin (aka Colonel Strelkov) despite several provocations the people of Ukraine did not want to fight. The downing of MH17 changed perceptions in the EU helped to drive a unified EU response with sanctions. This accident of war was a consequence of Russian attempts to remove the threat of Ukrainian air attacks against the separatist forces that Russia had created in Eastern Ukraine. These forces were initially led by Colonel Strelkov who had earlier led Russian forces in the takeover of Crimea. Friedman concentrates on changing attitudes in German favoring an easing of sanctions. Attitudes also need to change in Russia. Ukraine with a robust economy that buys Russian goods and welcomes tourists from Russia would benefit Russia far more than a frozen conflict in Ukraine. It is not only free and fair elections that are needed in the occupied territories in Luhansk and Donetsk. Ukrainian border control needs to be restored starting with Russia permitting OESC observers on the border of Ukraine with Russia in occupied territory.